Son of: George Heath (1847-1923) and Martha Charlotte Schmidt (1864-1951). 1.Cmdr John Moore Heath (1891-1944) who married Hilary Heath (nee Salter, ?-1984). Rowland married: Eileen Heath (nee Mills). 2. Rev George Nicholas Heath (1924-1989) who married Joyce Glynos. Roland, born at Rockhampton, Queensland, Sept. 25th, 1889. Proceeding to England in Dec. 1890, he lived at Cobham and Hampstead, and in due course was sent to a preparatory school kept by T. Spencer, of Naish House, near Clevedon, Som. ; since destroyed by fire. From this school, whilst under thirteen, he won a Winchester scholarship, being 58th in order of age, on a list of 67 candidates. He finished 11th, thus winning the last scholarship awarded. His progress through the school was steady, and several prizes fell to his share for French, mathematics and form work. On leaving Winchester after six years residence, he was 12th on the roll. He then obtained an exhibition at Merton College, Oxford, which was supplemented by a leaving exhibition from Winchester, both being held for four years. At Oxford he took a second class in Honour Mods., and a second in Greats, July, 1912. At an early age he decided that his choice of a profession was to be that of an ecclesiastic, and he is now reading theology at Pusey House, Oxford, for the Theological Schools in 1913. He took a 1st cl. From a fund at the disposal of the Bishop of Wakefield, in whose diocese he intends to work, he has since been awarded another exhibition tenable for two years, and hopes to be ordained at the end of 1914. At the outbreak of ware I was at Wells Theological College, intending to take Orders at Michaelmas, 1914. I decided, however, to join the Army instead, and accordingly joined a Public Schools Battalion in October, and was at Kempton Park, training, for a month. I then applied for and obtained a commission in the infantry, and was posted to the 8th E.. Surrey Regiment in November. At that time the battalion was in Belhus Par near Purfleet, under canvas. But in December we moved into huts. We belonged to the 55th Infantry Brigade, the other two Brigades of our Division, the 18th, being at Colchester. In April, 1915, we moved to Colchester, from there did a week's "trek" in Suffolk, for purposes of Brigade training, then followed a move to Codford on Salisbury Plain, where we remained till July, 1915. Throughout this period I was learning my duties as a platoon commander, and also acted as assistant to the Adjutant in the Orderly Room. On July 27th, 1915, we crossed to France, as part of Kitchener's 2nd Army. Things had been going badly. Our armies were learning the folly of attacking machine guns and barbed wire without artillery preparation, while Neuve Chapelle, and our futile attacks on the Aubern ridge, had revealed our serious lack of men and munitions, so that when we crossed, we confidently expected to be in the thick of affairs at once. Luckily for us, the staff knew that without active service training we should be useless, and we were destined for a spell in a quiet sector of the line. From Boulogne we went by train to Bertangles, just North of Amiens, and thence marched to billets in Dernaucourt, about four miles behind the line. Eventually we went into the line opposite Fricourt, first under the instruction with the 5th Bedfords, and then on our own. In September I was offered the command of a section of men from the 55th Brigade, who were to be attached to the 178 Tunnelling Company, R.E., to help them in mining work. I knew nothing of mining, nor did any one else in the Brigade, but the attraction of a semi-independent command was irresistible. I joined the 178 Company, R.E., on September 5th, 1915, and started on mining work in the sector held by my battalion. The work was very interesting, very safe at some times, and very dangerous at others. There was no danger from shells and trench mortars, but the French, from whom we had taken over in August, had very mistakenly begun mining without carryout out a vigorous policy; the Germans had replied with much more energy and effect, and by this time had got more than two-thirds of the way across No Man's Land, here about 100 yards wide, with their galleries. Consequently, going underground involved some uncertainty as to the return journey. But the life was far superior to that of the infantry. We had shorter spells in the trenches; two days in the line, and two or three days back at headquarters in Meaulte. This meant that one worked really hard for a definite visible result in the line and had a real rest out of it; whereas, the infantry's duties were those of passive routine in the line and very tedious and continuous training while out of it. So I continued till April, 1916. At mining we beat the German decisively with improvised methods. The army knew practically nothing of mining warfare in those days; but though the Germans blew in a small part of our trench in November, and we were fighting for our lives right up to the end of the year, three large mines blown by us on Boxing Day, 1915,gave them a shock from which they never recovered, and the balance henceforth swung in our favour. It is, however, significant of the uselessness of mining, except on a colossal scale, such as that used at Messines in 1917, that we were no more able to blow in their front line than they to destroy ours, nor would they have been much worse off, or we much better, had we succeeded. In April, 1916, the 18th Division, having side-slipped South, my section and I followed, and were attached to the 183 Tunnelling Company, R.E., living near Bray, and mining from Bois Francais on the left, to Maricourt on the right. Opposite Mametz, where my section worked, we had a working agreement, unexpressed, but real, with the Boche: neither side ever blew up a mine before 4pm or after 9pm. Consequently, between those hours, men were withdrawn from forward galleries, the result was, of course, a stalemate, and life became very tedious till the battle of the Somme began on July 1st, 1916. Mining on our sector was then given up, and we started work on wells, dug-outs and similar structures in the rear of our advancing line. In August, to my great relief, I was lent to 178 Company, R.E., as they were short of officers, and succeeded in staying with the Company for good, and in getting transferred to the R.E., as Lieutenant, my infantry rank which I had received in February, 1915. The next month I became Adjutant of the Company, a post which I held till October, 1918, when I transferred to 252 Company R.E. during that period the Company passed through a fairly typical series of experiences. We remained on the Somme, where we followed up the infantry, often working in the front line, and always within range of shell fire. We wintered near Combles, our period of maximum discomfort, and then followed the retreating Boche to the Hindenburg line. All through 1917, from Easter onwards, we were near Equancourt, and within reach of Peronne, and there we remained very peacefully till the end of the year. Just before the German retreat on February 27th, 1917, I was married to Eileen Mills, daughter of Canon Mill, of Bennington, Herts. My Company took part in the Cambrai success, and in the defeat which followed. Otherwise there was nothing of interest till the German offensive of March 21st, 1918. Luckily, the Division who were in front of us, held firm, and when retreat became necessary, it was gradual and orderly, practically without loss. Eventually we settled down near Albert, and remained there till the attacks began on August 5th, which let to the final defeat of the enemy. I saw nothing of these attacks, as my Company was in the back area at the time, and when they did more up, I was on leave. In October, 1918, I transferred to 252 Company R.E., and was with them till the end of December, 1918, when I returned to England for good. Till I was demobilised, I held a post as Officer Instructor under the Army Education Scheme in Oxford. 2nd Lieut. Nov. 15th, 1914. Mentioned in Despatches, Feb., 1916. This work lasted till early in May, 1919. During the preceding month I had applied for a post in the Board of Education, and after an interview, I was appointed as a junior examiner in the Board. I was demobilised, and left the Army, May 11th, 1919, and two days later I took up duty with the Civil Service. HEATH: MILLS - On the 27th Feb., 1917, at St. Peter's Church, Bennington, by the father of the bride, assisted by the Rev. 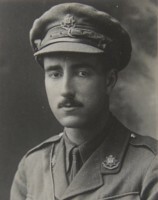 W. Eustace Mills, M.A., Rector of Walkern, brother of the bride, ROLAND HEAETH, Lieutenant, Royal Engineers, eldest son of George and Mrs. Heath, Redcott, Cobham, to EILEEN MAUDE, youngest daughter of Canon Mills, Rector of Bennington, Herts. On 22nd Feb, at 42,South Eaton Place, S.W., Eileen, wife of Roland Heath, of a son. Named Martin.